The city feels empty, but for those of us still here, there are plenty of activities to make the Fourth of July a fun one. Here’s to a fabulous July! We can’t think of a better way to spend a day off than at a dance party on Governors Island. At Body & Soul, relax, enjoy a picnic, and dance the afternoon away to live music all while taking in some impressive NYC views. Governors Island, New York. 3 p.m. to midnight. Get tickets here. Happy Fourth of July! Still don’t have a spot to watch the fireworks? Head to Allora Alto, the recently opened rooftop lounge on top of The Bernic Hotel. Located in Midtown on the hotel’s 22nd floor, this Italian bar boasts some amazing views of a slew of iconic NYC landmarks, plus creative cocktails and antipasti. 145 E. 47th St., Fl. 22, New York. Open 7 a.m. to 11 p.m. Get more information here. The first day back at work after a long weekend is always rough, full of catching up on emails and getting back into your normal routine. Make today a bit less painful by treating yourself to a decadent dessert that’s not only insanely easy to make but also healthy. Yes, it’s possible! 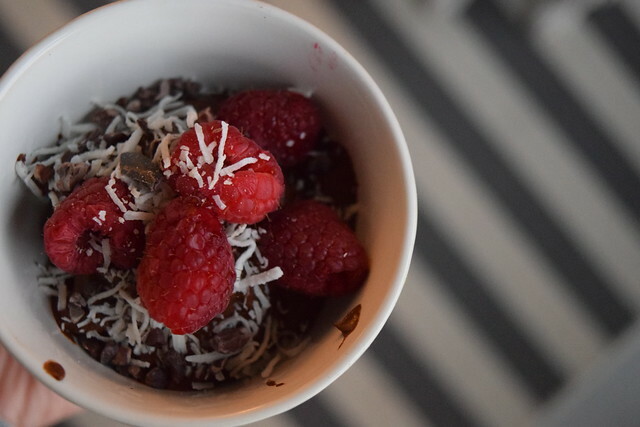 Check out this avocado chocolate pudding recipe that we recently tried — and loved! And then start counting down the days until your next long weekend. Cooper Hewitt’s popular summer performance series is back! Every Thursday through Aug. 24, the museum is extending its hours, plus at its Arthur Ross Terrace and Garden, guests can sip on cocktails, fill up on light fare, and enjoy live music. Consider this a grown-up Thirsty Thursday alternative. 2 E. 91st St., New York. 6-9 p.m. Get more information here. Date night just got a major upgrade. Tonight, check out Tribeca Drive-In, a new outdoor film screening series in downtown Manhattan. The series, held in an open-air setting that overlooks the Oculus and much of the Lower Manhattan cityscape, is programmed by the Tribeca Film Festival’s curators and features 10 features films set in NYC. Guests also have the option to purchase dinner from Eataly at Westfield World Trade Center and beer and wine sourced from the location’s Beer Table and Pure Liquid Wine & Spirits. This evening’s screening is of “Serendipity,” starring Kate Beckinsale and John Cusack. 185 Greenwich St., New York. Doors at 5 p.m., movie starts at 7:30 p.m. Get more information here. Immerse yourself in NYC’s unique art scene at ARTI.NYC’s Secret Garden Art Festival this weekend. Featuring art performances, live music, jam sessions, lectures, and much more—all at Fort Tilden, a unique beach getaway — this event can’t be missed. sTudio 7 Gallery, Fort Tilden, Queens. 2 p.m. Get more information here. Brunch, of course. Lately we’ve loved The Harold in Midtown, Añejo in Tribeca, and Clancey in the East Village.